'Moi' (Lowell Baumunk, R. 2004). Seedling #628Q. MDB, 9" (23 cm). Midseason bloom. Standards pink with medium purple midribs and dotting; style arms medium purple; falls white with narrow pink rim, purple plicata dotting and veining at hafts, sparsely dotted on bottom; beards tangerine, white at tip. 'Volts' X seedling #PACC-4: ('Pure Allure' x 'Chubby Cheeks'). 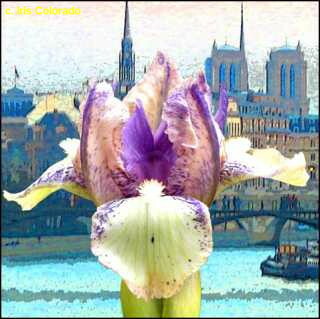 Iris Colorado 2004.